Igor Resnianski received his formal music degrees in Russia graduating with distinctions from Novosibirsk Music College under Professor Elena Storojuk, and Novosibirsk State Conservatory under Professor Mary Lebenzon. He continued his studies in the United States completing the Artist Diploma program under Dr. Tamás Ungár at Texas Christian University. In addition, he studied as a full scholarship student at the Van Cliburn International Summer Piano Institute, where he was under the tutelage of distinguished musicians Paul Badura-Skoda, John Lill, Fanny Waterman, and György Sebök. Mr. Resnianski holds a Doctoral degree from Temple University in Philadelphia where he studied with Professor Harvey Wedeen. A Steinway artist, Mr. Resnianski is a prizewinner of many national and international piano competitions. He was awarded the First Prize in the New Orleans International Piano Competition, Luisiana; the Bronze Medal in the International World Piano Competition, Cincinnati, Ohio; the Bronze Medal in the Nena Wideman International Piano Competition. In June 1996, Mr. Resnianski made his concerto debut in America performing with the Fort Worth Symphony Orchestra under conductor Keri-Lynn Wilson and in South America performing a solo recital at the International Music Festival in Medellin, Colombia. Since then he performed with the Kennett Symphony, New Orleans, Acadiana Symphony Orchestras, etc; gave solo recitals and chamber performances in the Steinway Hall, New York; Guizhou University, Guiyang China; Fort Worth and Arlington, TX; New Orleans and Lafayette, LA; Cincinnati, OH and Palm Beach, FL; Philadelphia, PA and Camden, NJ; Santa Clara, CA and Houston, TX; etc. His performances were televised and broadcasted in Novosibirsk, Russia; New Orleans, LA; Palm Beach, FL; Cincinnati, OH; etc. Mr. Resnianski performance was featured on the PBS/WHYY Y-Arts television channel. Named by Pennsylvania Music Teaches Association "2012 Music Teacher of the Year" for the State of Pennsylvania, Dr. Resnianski is highly sought-after teacher who regularly gives master classes throughout the US and abroad. For many years, he served as a faculty and guest artist at the TCU/ Cliburn Piano Institute Fort Worth, Texas. Since 2006 he is on the faculty of Piano Texas International Academy and Festival in Fort Worth. For several years he gave lectures at Rutgers University in Camden, NJ during the Mozart summer course. He is a regular faculty of the New Orleans Piano Institute and the University of Houston Piano Institute. (CCW faculty 2012, 2013, 2019) A native of the San Francisco Bay Area, pianist Mark Anderson’s performances as recitalist, soloist and chamber musician have met with wide critical acclaim. He has appeared as soloist with conductors such as Sir Simon Rattle, Nicholas McCegan, William Boughton, George Cleve, and Adam Fischer. In recital, Mark has appeared at New York’s Alice Tully Hall and Weill Hall, the Kennedy Center and the Phillips Gallery in Washington D.C., London's Wigmore Hall and Zurich's Tonhalle and elsewhere throughout Europe and the United States. In addition, his performances have been featured on BBC Radio 3, the CBC in Canada, and on radio and television in Spain, Italy, Ireland, Japan and the United States. Mr. Anderson records exclusively with Nimbus Records and has released recordings of works by Liszt, Schumann, Brahms and Dohnanyi, Copland and Gershwin, Mussorgsky and Stravinsky. He has recorded the complete solo piano works of Hans von Bülow for Nimbus in two discs released in 2010 and 2013. In his most recent research and recording project, he features the solo piano music of the Dutch composer Julius Röntgen, the first disc having been released in February 2015. In the United States, Mark Anderson was a student of Aiko Onishi while in the UK he studied with Ryszard Bakst and, most notably, Benjamin Kaplan in London. Mr. Anderson holds a bachelor degree in piano performance from San Jose State University as well as post-graduate degrees from the Royal Northern College of Music in Manchester, and the Royal Academy of Music in London where he continued his studies on a Fulbright Scholarship. In 2005, Mark Anderson founded New World Music Academy in Pleasanton, California. 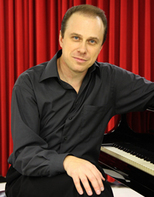 Mark Anderson was appointed Assistant Professor of Piano, Chamber Music and Piano Pedagogy at University of British Columbia School of Music in 2012. His students regularly participate and are often laureates of local, regional, national and international competitions. In addition to teaching, he makes solo, concerto and chamber appearances. Most recently, he has been active with his piano-duo and life partner Canadian pianist Michelle Mares. Joseph Ordaz (Artistic Director and Conductor) is currently the Music Director and Conductor of the Mission College Symphony in Santa Clara, California. He is also the Artistic Director and Conductor of the California Concerto Weekend for Amateur Pianists. Other orchestras that he has recently led in performance include the Berlin Sinfonietta, Winchester Orchestra, New Bridge Chamber Orchestra, Ohlone Symphony Orchestra and San Francisco State University Symphony. Mr Ordaz has worked with such artists as Gwendolyn Mok, Jon Nakamatsu, Vân-Ánh (Vanessa) Võ, Jassen Tadorav, and others. He has studied with many of the top conductors including Gustav Meier, Jorma Panula, John Farrerr, Diane Wittry, Adrian Gnam, Marin Alsop, Joann Falletta, Jorge Mester, Kirk Trevor, Harold Farbermann, Mitchell Sardou Klein and William LaRue Jones. He has also studied in programs including the London Conductor's Workshop at the Royal Academy of Music, International Conductor's Workshop's in Berlin, Germany; Conductor's Guild Workshop's with the Buffalo Philharmonic and at the Cabrillo Festival of Contemporary Music; California Conducting Institute with the Bakersfield Symphony, "Beyond the Baton" workshop with the Norwalk Symphony and others. He received his Bachelor of Music Degree from San Jose State University and his Master of Music Degree from the San Francisco Conservatory of Music. He has performed as piano soloist with the Ft. Worth Chamber Orchestra, San Francisco Concerto Orchestra, Nova Vista Symphony, Mission Chamber Orchestra, Mission College Symphony, South Valley Symphony, San Jose State University Symphony, and New England Symphonic Ensemble, and at the TCU/Cliburn Piano Institute and University of Maryland International Piano Festival. From 1991 - 2001, Mr. Ordaz also performed as a member of the Monterey Symphony and has performed in numerous recitals throughout the Bay Area including solo and chamber music. He has also served on the Board of Directors of Steinway Society - The Bay Area and presented pre-concert lectures for their concert series. Mr. Ordaz has previously taught at Gavilan and Foothill Colleges and for over ten years served as Chair of the Music Department at Mission College in Santa Clara, CA where he has been on the faculty since 1997. Michael Giel (Assistant Conductor) received his Bachelor of Music Performance in Viola and Bachelor of Music Education from Valdosta State University where he was a student of Karin Addis and Matson Topper. In 2008 he completed a Masters of Music Education from the University of Georgia. For the past seven years, Michael has served as the Orchestra Director for the Georgia Governors Honors Program at Valdosta State University. He is also the conductor for the Capitol City Opera Company based in Atlanta, GA, directing productions including "Il trittico," "Cosi fan tutte," "La boheme," and "Sweeney Todd." As a violist and violinist, Michael has performed with several orchestras in Georgia and Florida including the Gwinnett Philharmonic, Valdosta Symphony Orchestra, Ocmulgee Symphony, Gainesville (GA) Symphony, Albany (GA) Symphony, Coastal Symphony of Georgia, Rome (GA) Symphony, Atlanta Pops Orchestra, Ludwig Symphony Orchestra, Da Salo Solisti Chamber Orchestra, LaGrange Symphony, and the Central Florida Symphony. Sergiy Komirenko (Accompanist ) was born in Kyiv, Ukraine, and began studying piano at the age of five. Sergiy attended the Kyiv Lysenko Special Music School, where he was a student of Yuri Kot. After moving to the U.S. in 1998, Sergiy has studied with John Ruggero, Namiq Sultanov, James Giles, Nelita True, Elizabeth Buccheri (collaborative piano), Marcia Bosits (piano pedagogy), and Robert Gjerdingen (counterpoint). Sergiy holds a B.M. and a D.M.A. from Northwestern University, as well as an M.M. from the Eastman School of Music. Mr. Komirenko is currently an active teacher and accompanist in the Bay Area. All artists, guests, events and schedule times subject to change.